If for some reason you get the error below, while trying to assign a tag, it means that the Tag that you are trying to use has already been allocated to an existing site within your account. 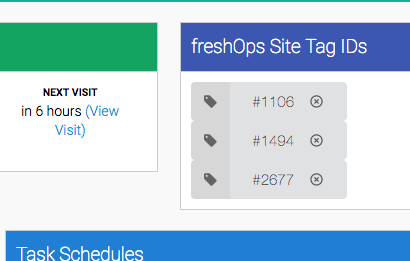 Step 2: Simply type 2518 into the search bar, and freshOps Search will surface the site the Tag is allocated to. Step 3: Navigate to that Site, and Remove the tag by clicking the little X icon next to the tag Number. Step 4: Once you click the X, you'll get the following message. Step 5: You'll then see a success message. Step 6: Navigate back to the original site and allocate the tag as required. NOTE: While we do out very best to always send out clean tags, if you get the following message instead, please contact support@freshops.com.au and provide us with the Tag ID and we'll wipe the tag clean for you.